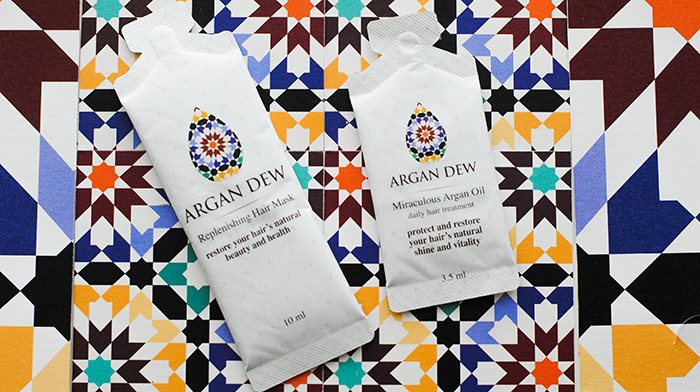 Shortly after I implemented a new rule where I would only review products whose names rhymed with the word "review", I was contacted by haircare company Argan Dew. The timing was perfect! The line is relatively new, so they were only able to spare samples of their products. I'm completely okay with that, because they were certainly not cheap with their samples and the packaging for the samples were adorable and made up the background that I placed the samples on in the above picture. Holy run-on sentence, Batman! I've spent the past month trying these products out, so let's get to the nitty gritty: I'm seriously impressed. I was very eager to try the Replenishing Hair Mask ($44), because my hair desperately needs all the moisture it can get. But because I'm lazy, I hate putting hair masks on because they tend to be really labor intensive: you apply the mask onto wet hair, put a shower cap on, let it soak overnight, wash it off in the morning. Too much work! So you can imagine my excitement when I realized that the Argan Dew mask only has to be massaged into wet hair and left on for five minutes, and then you wash it off. This is perfect! You can accomplish SO much in five minutes in the shower, like perfecting your dance routine to Beyonce's "Drunk in Love", performing your off-key rendition of the "Cups" song from Pitch Perfect, or even creating the shaving cream bikini of your dreams. All of that being said, once you wash the mask off, your hair is left feeling silky soft. Since I have curly hair, I struggle with knots to a ridiculous extent. This mask makes it SUPER easy to detangle in the shower. I was also provided a sample of the Miraculous Argan Oil ($39), which is a daily hair treatment. You're supposed to massage it into damp hair. I'm not a huge fan of hair oils, but that's only because I never really see a noticeable difference in my hair with them in it. This oil wasn't much different, but I will say that it smelled amazing and I enjoyed reaping the benefits of delicious-smelling hair (which tends to consist of semi-creepy "friends" sniffing your hair in public). So what's the verdict? I definitely recommend the Replenishing Hair Mask, as I love how moisturizing it is. If hair oils are your thing, then you may like the Argan Oil, but I would personally skip that because it's not a necessity for me. You can also request free samples right here, and you only need to pay $1.99 for shipping. Special note: Argan Dew is based in Israel, so shipping will take a little while longer than you may be accustomed to. I had a very positive experience with the brand overall. Disclosure: The samples in this post were provided by Argan Dew. All opinions stated are my own. I've been sampling this too and I totally agree with you, the mask is a must but I could give or take the oil! Love this mask! It's so great. Yea, it's definitely more of a leave-in conditioner type of thing. It is super moisturizing!